Several months ago, I stepped inside my local Kroger Marketplace and noticed a collection of brightly colored kitchen products on display. While I normally don’t pay much attention to that part of the store, these products caught my eye because they were so different. 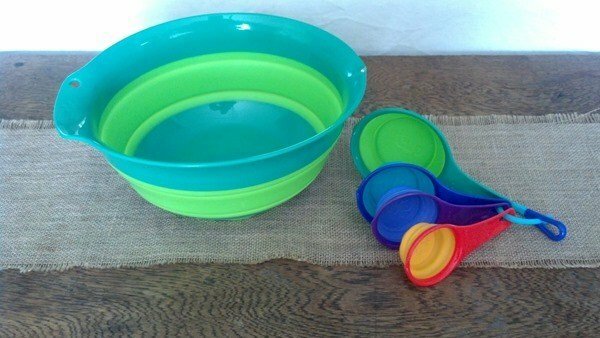 Unlike regular kitchen food prep items, these products were collapsible. As I stood at the display, I was transported back to the days when I was a full-time RVer and couldn’t help but think how perfectly these products would have been at that time. Finding room for everything I thought was necessary was always a struggle. If you have ever spent time traveling in an RV, I don’t need to remind you how precious of a commodity space is. The fabulous and innovative line of products are called Squish™ and are manufactured by Robinson Home Products. 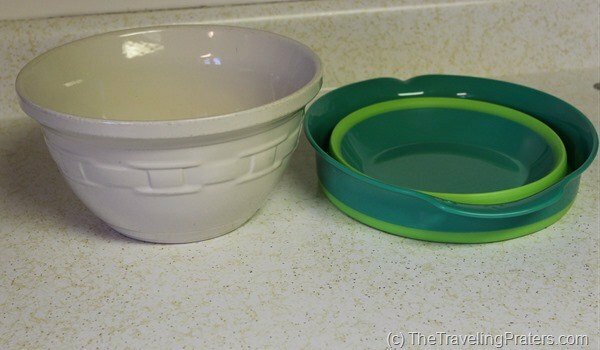 And while I think this entire line of kitchen items are perfect for RV enthusiasts, and those with very little kitchen or storage space, I also think they are ideal for frequent travelers in general. If you’re like my family, you may appreciate the benefits of eating home-cooked meals while you’re on the road. Preparing your own meals ensures picky eaters won’t be disappointed by trying something new, often allow for healthier meal choices and can save quite a bit of money on food costs. 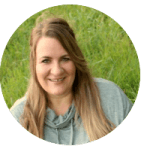 I always try to plan some meals for my family of five, unfortunately, many kitchenettes we’ve reserved fail to include basic kitchen tools such as colanders and measuring cups. That’s why I pack my own necessities, in my portable kitchen, when traveling. Squish™ products are perfect for the task. They are easy to pack and take up little space. As a frequent road-tripper who has a tendency to over pack, let me just state that I love products that take up as little room as possible. Plus, my teens can not keep their hands off these products. They are constantly “squishing and un-squishing” them, so I guess they could double as a toy for the kids. Okay, maybe I’m not serious when I say that the products also double as a toy, but they certainly are fun! Just check out this video from The Today Show. What do you think? Isn’t Squish great? Squish™ products are crafted using an exclusive design that merges flexibility with rigidity, resulting in products that you can use over and over with confidence. Each graduated layer “snaps” into place so you’re ensured it will not collapse when it’s in use. 1. Squish™ products are easy to pack and take up very little room, perfect for those with space challenges. 2. Squish™ are durable and sturdy. 3. Squish™ products feature non-slip grips and bases. 4. Squish™ products are FDA approved. 5. Squish™ products are BPA free. 6. 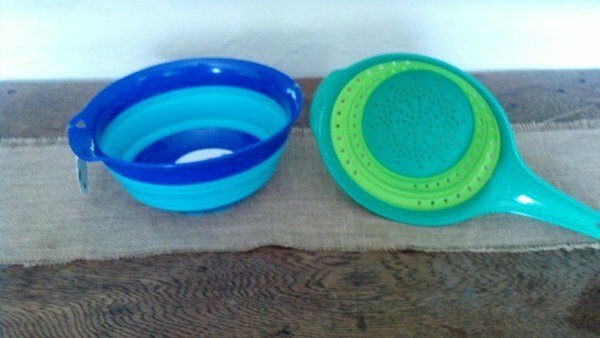 Squish™ products are dishwasher friendly. 7. Squish™ products come with a limited lifetime warranty. The only drawback I can find after using these products is that the surface will scratch so I would recommend that you use plastic cooking and serving utensils with all Squish™ products. 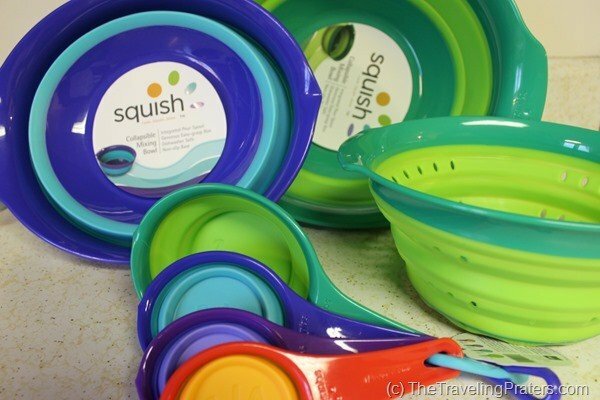 Squish™ currently offers a line of food prep items that include measuring spoons, measuring cups, a funnel and mini-funnel as well as colanders and mixing bowls. 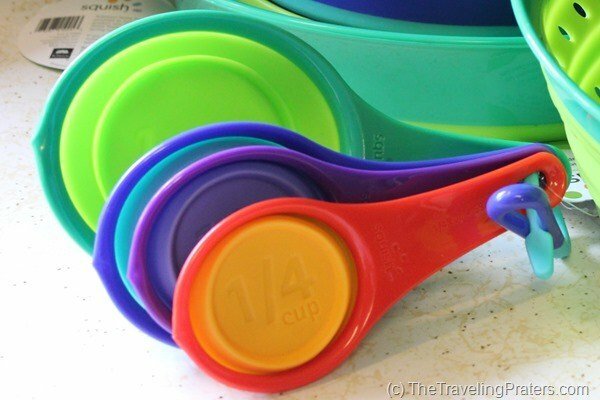 The measuring cups come in a colorful set of four in standard US measurements for $9.99. 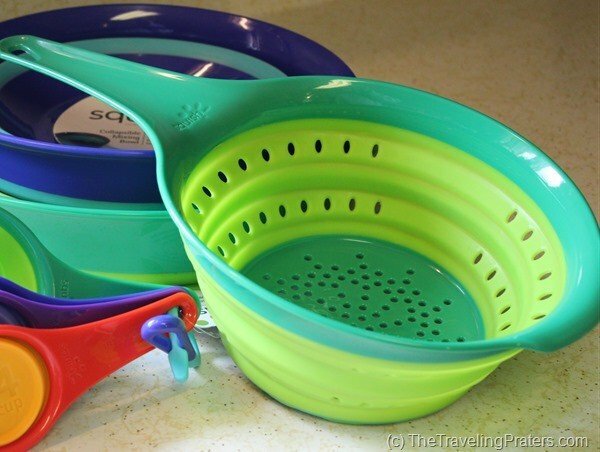 Squish™ offers a variety of different size colanders, 1 quart, 2 quart and 4 quart. Each long-handled colander is designed with a gently curved rim and generous drainage holes to get the job done. Priced at $8.99, $14.99 and $19.99 respectively, the colander is a great product to add to your portable kitchen because you’ll rarely find one in an even well-stocked kitchenettes. I love the mixing bowls. 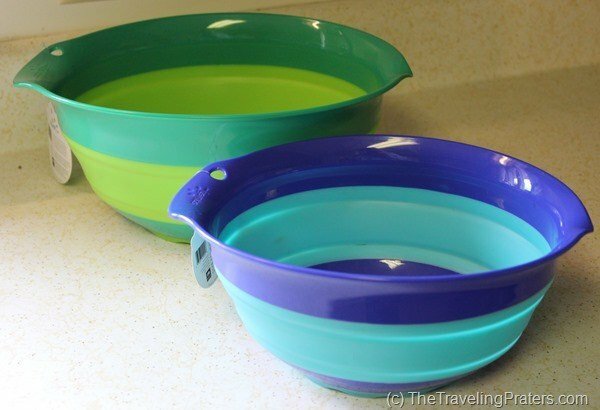 When we traveled in our motor home, one of the items I considered essential was my set of pottery mixing bowls. That was a big mistake. They were heavy and not as durable as I’d imagined for traveling. Before we made our first stop, my largest bowl had cracked and broken. 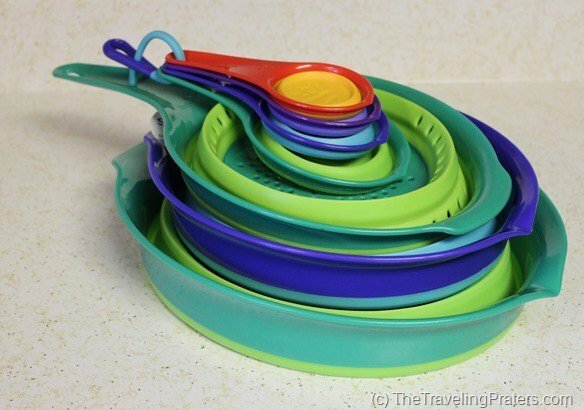 They may have been pretty, but unlike the Squish™ products, not very practical for the traveling lifestyle. The Squish™ mixing bowls are designed with a gently curved rim and pour spout. They take up a fraction of the space as a non-collapsible counterpart and nest when squished and unsquished. Available in 1.5 quart, 3 quart or 5 quart sizes, the bowls sell for $11.99, $14.99 and $19.99. Don’t you just LOVE what you see? 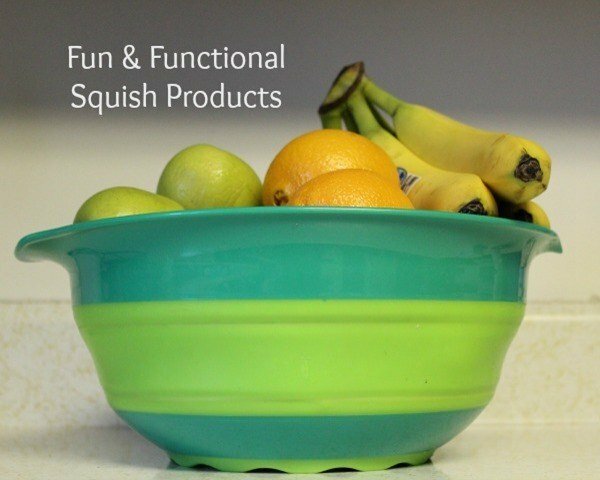 Squish™ Products are available to purchase at some Kroger Marketplace, Target, Bed Bath & Beyond and Amazon.com. Follow Robinson Home Products on Facebook to learn about new products and updates. Do you want to learn more about cooking in hotel rooms? Check out what I deem essential in my portable kitchen and view some of the meals my family has eaten on the road. Special thanks to Robinson Home Products for providing me with samples of the above Squish products as well as providing the giveaway items. I received no further compensation for this post. I’d put this in my camping gear! Wow! What awesome products! I remember having a hard plastic cup for camping and playing when I was young that folded up in a similar fashion. I had no idea there was a whole new line of products. Would be great on a trip for sure! I love any product that is a space saver. I would definitely use these at home and maybe not have things falling out of the cabinet on me all the time! These are so cool. I would totally use these at home. Our cabinet space is super limited and these are perfect! This looks neat! I’ve never seen these before! I have these and love them so much! Take up less space and work great. Would love, love, love these in my tiny camper!! Even if I don’t win, I plan on buying some before our next camping trip! Great space savers! And I love the colors! I love these products for travel. Great for packing berries food for roadtrips, plane trips, etc. 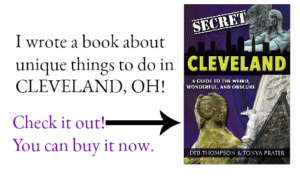 Sweetie & I dream of RVing one day, but for now I’d use it on my travels and at home. Gracias for the giveaway! These look so great! I love to cook so I have a bunch of kitchen gadgets. Anything that saves space or is easy to store has my vote. We would love to try these!!! They would be perfect for in the RV! These are great! So is being a full time RVer! Its in my plan once the kids are grown up and moved out! Thanks for sharing! I love these for home use! Anything that’s a space saver is FABulous in my book!